I have read several stories recently that make life in rural America seem pretty dismal – the population is aging and decreasing, everyone is poorly educated and addicted to drugs, and the land is either not accessible to the public, or it is being destroyed by crops and cows. I wonder how much time those journalists spent in rural America before they wrote those stories? Any places that matter take a time investment to understand. Well, I haven’t just visited the “flyover” states, I live here – five generations of my family have lived in the same central Montana county. I can’t speak for all of rural America, but I can speak about this place and I would like to challenge the stereotype. My husband and I have two children and we chose to raise them in rural America. We left good paying “regular” jobs to live and work in the country. We read a lot of children’s books and one of our favorites is Horton Hears a Who. I think often of those Whos and how they united to yell as loud as they could, “We are here! We are here! We are here!” for someone to hear them. There aren’t many of us out here – 500 people in all of Petroleum County. We are spread out, and we work full-time jobs, sometimes several jobs. We are mostly farmers and ranchers, teachers, and local government staff. We are not journalists, marketing directors, or graphic designers – it is hard to gather together to be loud enough to tell our own story. But, we have a story to tell. It’s not perfect and there are improvements to be made, for sure, but it is not so dismal as you might read in the New York Times. We love where we live, we work with our neighbors to keep our communities going, and we care about the land and our livestock. We are here, we have been here, and we would like to stay here. The Northern Great Plains – the grasslands and the breaks – are our home. We live on the prairie – an unforgiving, wonderful, crazy place. My great-great aunt used to say, “This country takes and it takes, and then, in one year, it gives it all back.” Mother Nature offers up the most inspiring moments, and the most devastating, and when you live with the land, you experience it all. You develop an appreciation for the land that comes from shared experiences. And those experiences are shared with your neighbors as well. You develop a bond with those people stronger than can be described. It’s a bond that when there is a death in the community, 300 people attend the funeral – the only space large enough is the school gymnasium. Most of us in rural central Montana are lucky enough to live, work, and play where our homes are. We think we are the luckiest people on earth and we would like to share it with anyone who wants to come visit. But, we want you to understand it when you come. In our little slice of paradise, we get 13 inches of precipitation per year. Santa Fe gets 14. The average for the United States is 39 inches per year. So, unless you are from the desert southwest, we are going to look a little bit like a desert. We all know that the majority of this precious precipitation needs to come from April to June to get everything growing. So, when you come to visit, ask how much rain and snow we’ve had and when it came so you can understand if we are having a wet or dry year – which makes all the difference. We are passionate about our land. This includes the public land where we graze our cattle and the private land that has sometimes been in families for over 100 years. Most of Petroleum County is grassland or the Missouri River Breaks – land that is not suitable for growing crops, so instead, most of us raise cattle. Photo by Reba Ahlgren . The grasslands evolved with grazers. The two are codependent on each other and the grasslands need a large herbivore grazing it just as much as the cattle need the grasslands. When a cow grazes, she chomps off part of the plant, which allows it to regrow. When a plant does not have the opportunity to regrow, it becomes decadent – old growth dies and clogs out any chance for new growth to happen. The wildlife, such as deer and antelope, don’t graze this old, dead grass. Cattle hooves break up plants and create litter that covers the ground – this catches water and also helps plants to regrow. And, finally, cows poop and pee – the best form of natural (and free!) fertilization out there. Grazing is part of the whole system that enhances both the soils and everything that is below ground, as well as the grasses and other plants above ground. Ranchers provide, “ecosystem services.” This means that when we use good land management practices, we provide benefits to the land from which all of society benefits. Healthy grasslands, which can be achieved through cattle grazing, provide ecosystem services like carbon sequestration, water filtration and water storage, open spaces, and wildlife habitat. The beauty of using cattle to graze the grasslands is that they can be managed to address the needs of the land. For example, a noxious weed infestation can be grazed at a certain time of year to get it under control. Where build-up of plant material has happened, grazing that build-up can keep fire danger managed to a more natural level. Studies of grassland songbirds have shown that some of these birds need short grasses, and even prefer bare ground, at certain times of the year. Ranchers can graze their cattle through pastures on a rotation that benefits these declining bird populations. Ranching on public lands saves money for the government. The Bureau of Land Management spends $2 per acre for the lands that ranchers use, but it spends $5 per acre to maintain ungrazed land. We are Here: We are Passionate about our Communities. “I don’t think that people understand how passionate we are about our communities,” one of my neighbors recently told me. Our tiny community of 500 (ages 4 months to 102) volunteered 8,736 hours in 2018. These hours were spent on county commissions, town councils, school boards, conservation district boards, ambulance, fire, search and rescues, sheriff’s reserve, and on and on. Imagine serving on an ambulance crew when you know that most of the calls will be for someone that you know. We are part of the two percent of the population producing food for the other 98 percent. Tax dollars support farmers and ranchers through cost share programs that help provide range improvements for both livestock and wildlife. These best management practices not only help ranchers with risk management, but also contribute to making food everywhere more affordable. These tax dollars amount to less than ½ of 1 percent of the total US budget. In Petroleum County alone, our 105 agricultural operations produce enough beef to feed 127,745 people for one year. We are passionate about our children. The Winnett School is a Blue Ribbon award-winning school. 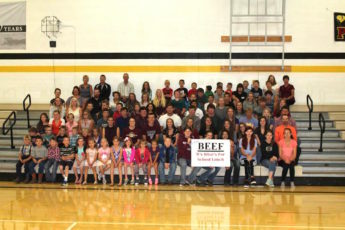 The school’s food program has also won awards, and, most recently, local ranchers have begun donating beef to the school so that we know where our children’s beef comes from. The high school graduation rate is 98%. There is also plenty to do. My children take guitar and piano lessons in Winnett on Mondays, they play basketball on Tuesdays, they go to “Kids’ Club” at the church on Thursdays, and they are 4-H members – and they are only six and eight years old. When they aren’t busy with social and school activities, they help us on the ranch. They have put out and picked up miles and miles of electric fence. They are learning about hard work, caring for animals, and nurturing the land by getting outside and doing it. Come visit and you too can do some fencing. When you do, we’ll take you to the school. Grades kindergarten through 12 are all under the same roof. The Technology Education teacher will show you his 3D printer, plasma cutter, welders, and wood shop. You’ll see the school-community library with computer and internet access for patrons. Come on a Friday or Saturday night and you’ll see the gymnasium packed for basketball games. Since 2010, our community has grown by 5.9 percent, which is more than Park and Ravalli Counties in trendy western Montana. There are young people returning home, and new people coming to the area, at a high rate. This is something that I hear about in our neighboring communities as well. Winnett and the northern part of the county have fiber optics. We have access to the highest speed internet of anyone in the entire United States. When you visit, you won’t have cell service, but you can stream any YouTube video that you want (well, not any, but we can talk about that when you get here). 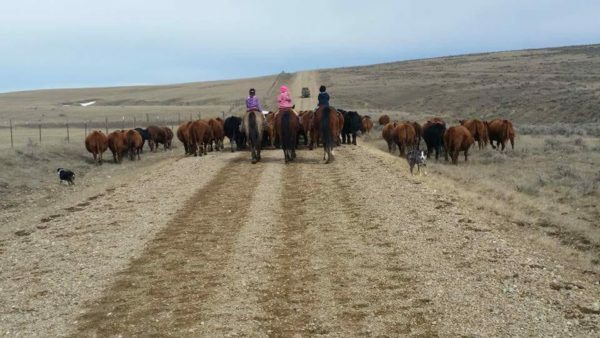 If you would like to visit a ranch in central Montana, contact the Fergus/Petroleum County Extension Office at 406-535-3919 or fergus@montana.edu. Laura Nowlin is a wife and mother of two, working, living, and playing on a little piece of paradise in central Montana, north of the town of Winnett. She and her husband ranch. She is also a part-time coordinator for the Musselshell Watershed Coalition. Between the two of them, they serve in seven community groups. Laura is a board member of the Winnett ACES (Agricultural Community Enhancement and Sustainability). Feature Photo by Reba Ahlgren. MSU Extension. Petroleum County quick facts.